The dynamic “Melting Pot of Central Luzon”, which is a 2-hour drive from Manila, is packed with lots of local sites and exciting activities. You will surely enjoy what Tarlac has to offer, as it features notable and exciting destinations like the Monasterio de Tarlac, Aquino Center and Museum, and Kart City Tarlac. But if you’re looking for a more laid-back escape, you can hit a few golf balls at the nearby Luisita Golf & Country Club, or go kayaking at the beautifully maintained Tarlac Recreational Park. All these and more can be found just in Tarlac. Our Microtel North Luzon Tour group was able to explore the City of Tarlac for a day and a half. Our brief stay might have limited us from visiting all the other attractions. But every bit of our trip was well worth the time and effort. Of course, if you have more time to spare, drive up to the city and check out some of the places that our group got to see this month. 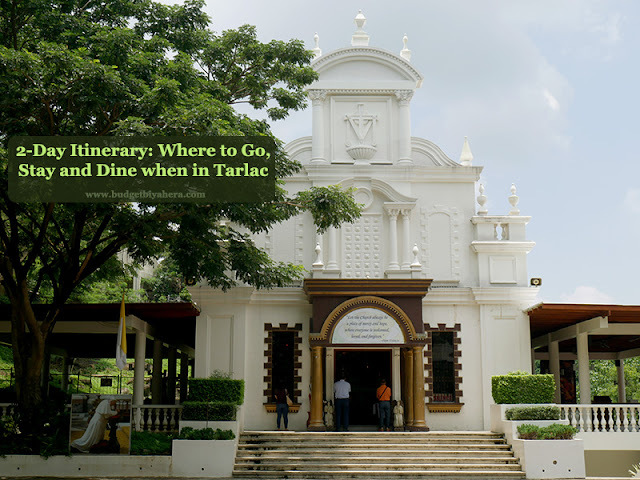 About an hour and fifteen-minute drive from Luisita, Tarlac is Monasterio de Tarlac, Church Of The Risen Christ - a popular tourist destination and pilgrimage site in the province of Tarlac. The monastery, which sits atop Mount Resurrection, holds a relic of the True Cross. It also features a beautiful, 30-foot white sculpture of the Risen Christ, which faces a magnificent view of the Zambales Mountain Range. NOTE: Monasterio de Tarlac is only accessible via private vehicle since there are no public transportation options being offered at this time. The Tarlac Recreational Park (also known as Jose V. Yap Sports and Recreational Complex), which is located in San Jose, is a 78-hectare property. It is a recreational complex that offers a wide range of sports and outdoor activities. You can run by the vast oval track, kayak or fish by the lagoon (or watch horses grazing nearby), bike by its uphill and downhill landscapes, swim in its Olympic-size pool, or go camping by its verdant grounds. The Aquino Center & Museum is an eye-opener, as a visit to this rich repository reintroduces you to a very significant time in Philippine history. The expansive gallery in Hacienda Luisita, which is owned and operated by the Ninoy and Cory Aquino Foundation, houses the memorabilia of two well-loved Filipino icons: the late Senator Benigno “Ninoy” Aquino Jr., and his late wife, President Corazon “Cory” Aquino. Some of the highlights of our tour inside the museum was learning about Ninoy’s fast-paced life, his momentous development into politics (from being the youngest mayor at 22 to being recognized as the youngest Philippine Senator at age 34), his solitary confinement at Fort Magsaysay (arrested after the declaration of Martial Law), his assassination at the Manila International Airport (his actual blood-stained clothes and photos of his open-casket are displayed at the museum), and the inspiring movement of the People Power that lead Cory to become the 11th President of the Philippines. Entrance Fees: Adults (P100), *Senior Citizens (P80), *Students (P50), and Masteral Doctorate (P100). *Present ID. The Kart City Tarlac is one of the top destinations in the city, making it a favorite hangout place for both locals and visitors. You won’t miss it, as it’s literally just across SM City Tarlac. Aside from that, KCT boasts of a world-class karting facility, which you will see in their well-designed racetrack, and European-made go-karts. The brand has successfully created a dynamic concept, as they’ve merged different attractions all in one place. But other than the racetrack, they also offer several dining options that cater to various age groups - making the recreational complex a one-stop-shop for food, entertainment, and adventure. NOTE: We weren’t able to drive that night, as the tracks were flooded from the afternoon’s heavy downpour. But I rode one for photo purposes only. Safety first! If you’re looking to swing some balls while breathing in some fresh air, then head to Luisita Golf & Country Club. Considered as one of the finest in the Philippines, the 18-hole championship course in Central Luzon was designed by Robert Trent Jones Sr. You’ll also find the golf course interesting, as it features small man-made bodies of water. Opening Hours: Monday to Sunday (6:00 AM to 5:00 PM). Closed on Wednesdays. My group and I were only able to see the façade of the buildings from afar, as the Central Azucarera de Tarlac was closed to the public. We were just told that it’s a sugar mill and refinery, and a distillery. NOTE: Walk-ins aren’t allowed. But you may try and schedule an appointment if you’d like to make a visit. As someone who recently had to change diets, I still couldn’t help but take spoonfuls of this eatery’s local dishes. Our orders consisted of Inihaw na Manok at Isda (grilled chicken and fish), Ensaladang Talong (grilled eggplant with sliced tomatoes and onions) and Pork Sisig (made from parts of pig's head and liver). My favorite would have to be the Pork Sisig, as it was cooked with a different twist to it. Victor’s version was a bit smoky in taste, with a slightly moist consistency. Victor’s Ihaw-Ihaw is located along MacArthur Highway in San Rafael, Tarlac City. It’s a short 10-minute drive from Microtel Tarlac. We may have missed our chance at driving the go-karts at the Kart City Tarlac. But we definitely enjoyed our time at The Gameroom Sports Bar (one of six dining options in KCT). Our dinner was composed of a varied set of dishes. The Filipino viands that were served to us for dinner were Pork Sinigang, Sizzling Pork Sisig, Krispy Pata, and Kare-Kare. We were also served two types of Pizza Rolls with meat and seafood variations, and a bowl of Grilled Chicken Salad with Vinaigrette sauce. The Gameroom Sports Bar is located inside Kart City Tarlac, MacArthur Highway in San Roque, Tarlac City. I’ve stayed in other Microtel properties before. But it was my first time to try their hotel in Tarlac City. Thanks to our friends at Microtel North Luzon, my friends and I were able to experience the very first Microtel Hotel in the Philippines. Microtel by Wyndham Tarlac is a 50-room hotel that is located inside Hacienda Luisita (not too far from the Robinson’s Complex and the Aquino Center and Museum). 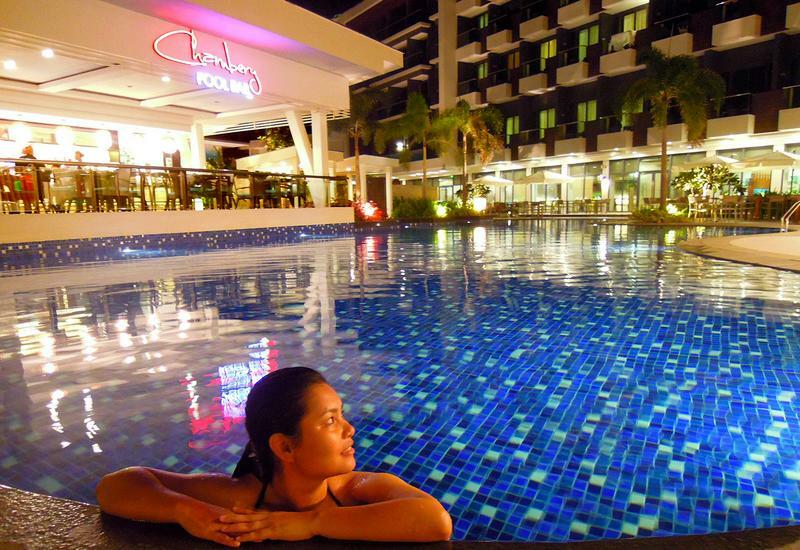 Whether you’re in Tarlac City for business or leisure, the noteworthy establishment is sure to provide you with spacious accommodations that will make you feel relaxed and comfortable all throughout. I usually stay in a 2 Queen Beds Room (comes with a 32” Flat screen Cable TV, individually controlled A/C unit, IDD/NDD phone, toilet and shower with hot and cold water, hair dryer, radio clock, window seat, fully automated fire safety system). But this time, I got to stay in a 1 Queen Bed Suite, and it was a pretty nice experience. Read my full hotel review HERE. Tarlac City is accessible through two major and world-class expressways in the Philippines – the Tarlac-Pangasinan-La Union Expressway (TPLEX), and Subic-Clark-Tarlac Expressway (SCTEX).